According to ancient cycles, our Solar year is divided into four quadrants which commence on, or about, 21st December, 21st March, 21st June and 21st September each year. These Equinoxes and Solstices are the Cardinal points of our calendar, spiritual windows through which celestial energies descend during auspicious Festivals of Light. On a more mundane level it is possible to gain an overview of the next few months by an examination of these starmaps. In this article we look to the Summer Solstice (southern hemisphere) which fell on 22nd December, 2013 for indicators of the following 4 months. This starmap holds insight relevant for humanity until the Autumn Equinox (southern hemisphere) on 21st March, 2014. The Solstice chart is influenced by a disseminating moon – we all need to think big, get out of our comfort zones; learn new skills; pass on our life experiences and learn from life’s lessons. Vulcan sits combust the Sun in Sagittarius, so expect the global immigration /refugee crisis to intensify this quarter. Vulcan may also herald an increase in volcanic activity around the planet. The North Node in Scorpio falls in the degree of money; ponder deeply on what you value, get your finances in order and orient yourself to the inner worlds of Light, where all true security lies. Saturn also falls in Scorpio in the degree associated with ambition and goals. So examine all your ambitions and cast aside those that are self serving. Lift your eyes to goals that increase the joy in the world and your own life. Saturn is strongly squared by the Moon in Leo in the 10th house. Here in Australia, this indicates that the general populace, our goals, hopes and dreams are severely restricted by government policies and decisions. The Sun in Capricorn is the focus of two challenging aspects from Mars and Uranus. Effectively a cardinal grand cross, including the Earth and wide aspects to Pluto, dominates this starmap. We are all called to deal with the unexpected, move out of whatever rut impedes our path, release the past and refocus on goals and directions that benefit our family, community and nation as a whole. Pluto in the second house does not unfortunately bode well for the Australian budget – hard financial times are indicated. We can expect an increase in job losses and companies closing throughout the country. Share your resources and learn to live within your means. Neptune and Chiron, which have been travelling close together for the last year in Pisces, are square the Sagittarius Ascendant. Place your faith in the heart, let old illusions fall away; reach deep within to find your strength and optimism. Aspects of your life that are build upon sand will begin to fall away. Mercury is stationery in Sagittarius, warning us that the global epidemic of refugees is reaching a tipping point over the next few months. Similarly this placement indicates the increasing environmental crisis impacting earth and all species. Humanity still has the opportunity to move through this crisis, if we collectively act with generosity of Spirit. In Australia the resources boom has ended – the recession is well underway. Jupiter is placed in Cancer in the sign of it’s beneficence. Despite the challenges of 2014 grace flows unerringly towards humanity. 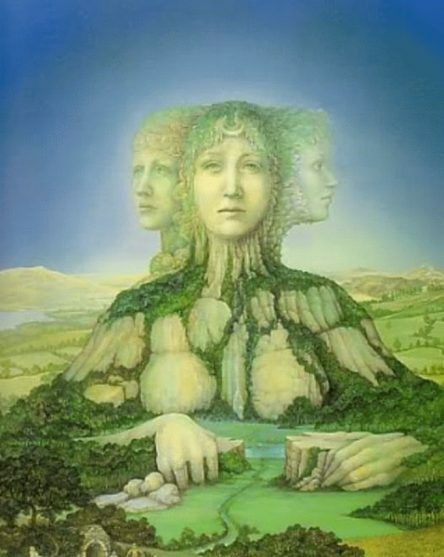 The Divine Mothers of the earth are always available when we call. Jupiter forms a beautiful trine to Saturn. If our motivations in life are from the heart then we will be supported, guided and protected, no matter what outer circumstances prevail. Connect with the Divine Mothers through prayers, healing, Nature or in any way that speaks to you. They are our lifeline and succour in times of need. Uranus in Aries trines the Sagittarius Ascendant. Phoenix-like we can rise from the ashes of our past with courage and optimism if we dare to visualize our future and the world through the Light of Hope. Network with people of faith and vision and your eyes will see a world of beauty. To understand how this Solstice chart affects you individually or other countries around the world is beyond the scope of this article. Chandra has recently moved to South East Queensland and looks forward to connecting with the local networks of Light in this region; as well as friends from around the world.